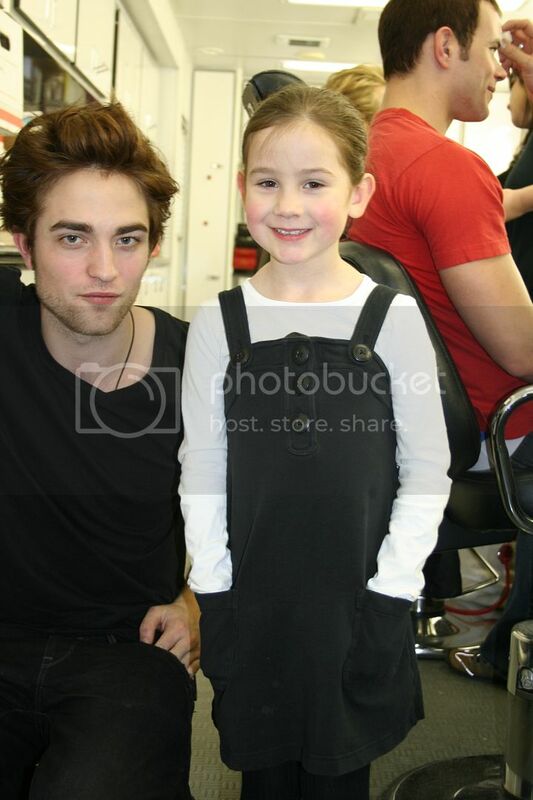 We had this gorgeous pic of Robert Patinson with Catherine Grimme who played young Bella in Twilight before but we didn't have it in UHQ. Loads of jawporn, the perfect amount of stubble and the hair! On meeting Pattinson: "He was very nice. I was kind of star-struck. Is he cute? That's what most people say. I'm not so sure about that myself." Mother Kim Grimme adds: "Catherine Hardwicke made a point of introducing Robert to Cat (as the family calls her). He got down on his knees so he would be at eye level. And, of course, because he's got a British accent, everything sounds better. Cat said she liked him in 'Harry Potter and the Order of the Phoenix' (Pattinson played Cedric Diggory)(Gozde: Well he actually played Cedric in The Goblet of Fire and he is listed in the cast for Order of the Phoenix because they used his images from GOF but that's just a detail :). We took pictures of her with Robert, and with Kristen Stewart (Bella). He was talking and joking with the other cast. Kristen was a little more introverted.